AnastasiaDate is one of the oldest international dating sites. For more than twenty years, the service has been connecting the hearts of singles all over the world. However, the lion’s share of its male audience is from the US and Canada, and women are mainly from Eastern European countries, such as Ukraine and Russia. Some people firmly believe that sites like AnastasiaDate are stuffed with fake profiles. In this specific case, more people trust the service. A lot of happy clients share their love stories and keep thanking AnastasiaDate and all its team for the opportunity to get together with their soulmate. New members join every day to have an exciting online dating experience. The website has a lot of apparent advantages. There is a range of disadvantages, though. Plus, there are more things you should consider before joining, like the fact that free members have quite limited access to the site features. Here, we are going to consider all the pros and cons of AnastasiaDate and find out if it is advantageous to use the service. 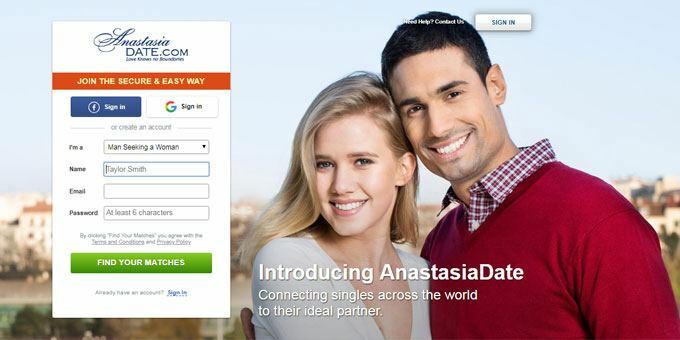 The overwhelming majority of women who register on AnastasiaDate come from Eastern Europe. These ladies are commonly referred to as mail-order brides. They want to meet a decent man online for a serious commitment. Most of them want to start a family with a foreigner. Men on AnastasiaDate are mainly from North America. They are fascinated with European women’ beauty and know that they make perfect wives. Most of the relationships started on this service are straight-oriented. This is most definitely not a hookup website because men come here to have a serious relationship too. So, if you are in search of a life partner with whom you would like to spend all your life with, AnastasiaDate is the website you need. There are various ways to communicate with people you like: messaging, chat, and even telephone conferences. To attract a girl’s attention, you might send her flowers and small tokens. In contrast with a lot of other dating platforms, AnastasiaDate provides you with an opportunity to send actual (not virtual) presents. The users get grouped into communities based on their individual interests. These are Fitness Fans, Nature Girls, Animal Lovers, Sun Seekers, and City Trippers. Such categories make it much easier for you to find your perfect match. It is entirely effortless to get an account on AnastasiaDate. Like many other dating platforms, the service offers you two options to choose from: registering via email or using your Facebook or Google account to sign in. Signing in via social media is much quicker, but email registration doesn’t take you too much time either. You merely have to type in an email address, come up with a login and password, and verify your email in a couple of clicks. Facebook or Google are only used for entering the site. You don’t have to fear that your activity on AnastasiaDate will be accessible to other social media users. Mind that you won’t be forced to spend hours filling out numerous fields, writing essays about your views on the future and relationships, and describing your potential partner. Almost nothing in a profile form is obligatory to submit. You should, of course, indicate your gender, gender preference, age, and location. But you can skip a lot of personal information. On the other hand, we wouldn’t advise you to do so. Maybe, when you feel like it, you should invest some time in it. The more informative your profile is, the more chances you have to find a girl who will fall for you. Just look at ladies’ profiles! They are all filled out and include a lot of photos and videos because no lady will want to waste her time on the website without getting noticed by potential admirers. The minimum time and effort spent on creating a profile attract men because they often find it difficult to introduce themselves before they get used to the service. On the downside, this also gives scammers and other ill-intended people an opportunity to start fake profiles. But the website does everything possible to reduce the number of those. The searching algorithms the service applies have proven to be quite capable, although there is nothing innovative in them. The smart search uses diversified filters: from the most general ones (gender, age, marital status, and location) to more advanced – language skills, habits, interests, etc. In case you like someone and want to contact them later, you can copy their ID and use it to search for this profile. AnastasiaDate has an entire set of communication channels that allow you to stay in touch with other users whenever you need it. You can attach photos to messages sent to other users, although this option is not free of charge. To use it, you are to spend a certain amount of credits bought for real money. Credits also allow you to enjoy one of the most convenient communication channels – a Call Me feature. This stands for an actual real-time phone conversation with any lady you like. This is very beneficial both on the very first stages of your relationship and when you want to bring your romance to the next level. Hearing a lady’s voice helps to create a strong spiritual bond between the two of you and, importantly, make sure it is a real person. Alternatively, you can use a chat room to find out more about each other and see where your interaction can go. All these features are unavailable for free members, so buying credits makes a lot of sense if you are indeed looking for a real long-term commitment with someone you can trust. What are profiles like on AnastasiaDate? The security issues are a top concern of any international dating site. AnastasiaDate does its best to ensure its clients that using this website is safe. As we have mentioned above, profiles need to get verified with a link sent to users via email. Some amount of fake profiles is inevitable because scams strive to trick users desperate for love and attention. The good thing is that every profile that has undergone verification gets marked as such, so you can only choose users who have proven to be real. There is a birthday date indicated on every woman’s page, and you can compliment her with a bouquet or even a valuable gift on this day. This lets you stand out among other admirers because, let’s face it, all girls like gifts on special occasions, at least. In case you wish to know how a lady behaves in real life, you can check out a bunch of videos attached to her profile, and you don’t have to spend any credits on that. Any information from a profile can be printed. An application is a must-have of every dating website because people hardly spend hours chatting with other singles in front of their laptops these days. The AnastasiaDate app is free to download from Google Play and App Store. Please, note that it only works for Android and iOS at least updated to the versions 4.0.3 and 9.0 respectively. Before you log in, the app asks you whether you have reached the age of 18 which is quite understandable given the purposes of its clients. The app is quite handy and navigable, and its interface is compact and well-thought out. There are no bugs as AnastasiaDate team responses to any technical issues with no delay. Both desktop version and application have similar functions, so you won’t miss anything when you are on the go. Besides, the app is a 100% guarantee that you will receive all the messages on time. Is the website easy to use? The first thing you must love about the service is the abundance of pretty ladies’ pictures. They just pop up on your right every time you browse the website. However, AnastasiaDate is not only about profiles. A lot of helpful information is also easy to find on the website. For example, clients can get smart tips on how to make their online dating experience more enjoyable and less risky, in Dating Securely tab. And in case they have questions, they will likely find answers in the FAQ section. If you feel reluctant about seeking your soulmate online or merely want to understand how it all works, get some inspiration in Success Stories. Here, those who have found love on AnastasiaDate share their experience and give some advice on using the website. Besides, you can check out News and Updates and Media Publications. In the website design, the developers have used calming light colors which make users feel relaxed and encourage them to come back. Other websites might be overloaded with unnecessary features, have a lot of irritating details, and use the colors that are supposed to make someone feel naughty, apparently. But in reality, it works the other way around. People don’t get turned on. They get tired and less motivated. It can’t be said for sure whether you should pay for using AnastasiaDate right away or wait before you subscribe. On the one hand, non-paying members save their money, but their experience is far from what a premium member gets. On the other hand, you can come across your destiny accidentally without any subscription. But usually, you still want to get something in addition, like a chance to send flowers on a lady’s birthday or talk on the phone once in a while. If you think that calling a lady will not be productive because of the language barrier and thus, you don’t need it – this is not the case with AnastasiaDate clients. The website provides you with professional interpreter services to make your communication as smooth as possible. So anyway, buying credits is never a bad idea. You can buy from 20 to 5000 credits. Mind that the larger package you purchase, the more money you save. And the membership will cost you only $9.99 per month. Everyone who is searching for the love of their life will appreciate how professionally AnastasiaDate team helps their clients to success. The advantages of the website are quite distinct. It has plenty of active users, both male and female, to choose from. The profiles are informative and touch upon many personal questions that matter when you are seeking a perfect partner. There is a variety of channels you can use to communicate with as many users as you want to. And what is even more exciting, AnastasiaDate is a real way to meet a person who lives across the oceans for real. Plenty of happy couples that have been brought together on the website are the best proof of its effectiveness. The site has its pitfalls, of course. Everybody can come across a fake profile, even though coping with security issues is one of the AnastasiaDate priorities. You see, for scams, this is the way to gain benefit, and they try their best to do it. On the other hand, it’s always possible to tell a suspicious profile from a verified one with the help of that verification mark it has or doesn’t have. Another controversial issue about AnastasiaDate is that non-paying members are deprived of using more than half of the website functionality. But the site has a ridiculously low membership fee and a wide choice of credit packages that come at different prices. These make it easier to make up your mind, become a premium member, and be in no way limited.